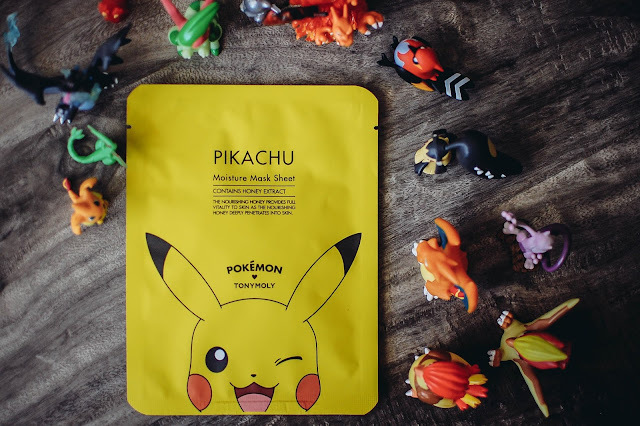 Before I launch into the sheer awesomeness of this face mask I want to discuss Pokemon. Pokemon came into my life about 3 or 4 years ago when a friend's son came over with his cards and showed them to Savanna. It was love at first sight. Soon she was saving her allowance and generating a small pile of pocket monsters. As I discovered that her interest only built and never waned, I bought in. I remind myself of my own mother when I was a kid. I was legit obsessed with Archie comics and books of all types. Every single time we went grocery shopping my mom would indulge me in a comic. Every book fair I was allowed to pick out a few books. She fostered my love of reading single handedly. Then in the mid-90's, in my early teen years, I became obsessed with the Atlanta Braves and then baseball cards. Mom took me to the cards stores, auctions, and let me pick out packs every now and then when my allowance and work money was running low from my days working at the golf course. Savanna totally benefits from my appreciation for childhood interests. And my appreciation of obsessions. So here we are a few years later and now she is an official Pokemon trainer with a player ID, two tournaments and one win under her belt. Scarlette collects Pokemon too, but her joy is purely surface right now. She collects the cards but thinks battling looks way too hard. Just give her the kawaii. This Christmas is all about that Pokemon. I sent money to my bestie in Japan to pick up a few things and my bloggy friend Liz in Korea to pick up a few things for Santa to drop in their stockings and under the tree. I saw in Korea there were Pokemon Tony Moly face soaps and hand creams. Liz was very kind and generous and said she would see what she could find. She found the mother load. The girls stockings will be filled with them. I must snag a Snorlax for myself but I can't bust it out until Santa leaves it in my own stocking. Hey he's a fat cat who eats and sleeps all day. I can relate. Liz generously sent me two sheet masks too. Now those I could not wait for, but the girls don't suspect a thing. Face sheet masks just aren't their thing. But lotions. Savanna has a full sized Victoria's Secret lotion by her bedside that she slathers on every night like a mini me. Now she can smell like Charmander. So back to the mask, I loved it. It did not really have a scent. The shape fit my face nicely without any alteration. The honey infused serum felt hydrating on my skin. There was a slight sensation while wearing it. Like a soft exfoliation. My skin never turned red, but it felt like it was doing something positive. Sounds weird I bet. Maybe it was just Pikachu lending some of her electric magic. I left it on for about 20 minutes then massaged the rest of the serum into my face, neck and chest. Several hours later I still felt a nice firmness and nourishment on my skin. I would buy them again and have been eyeing a few 5 mask sets on eBay for $8.00. 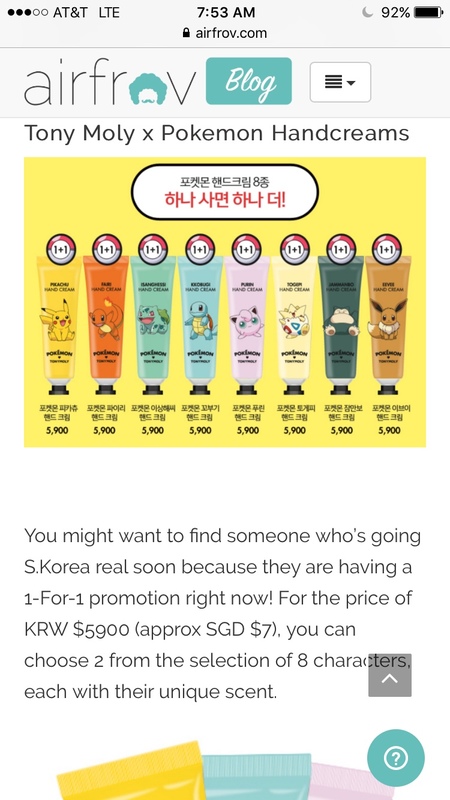 They were free with any Pokemon purchase from Tony Moly and are still available if you shop at K-Beauty Now (beware... shipping is cray cray, like $35.00 or more). 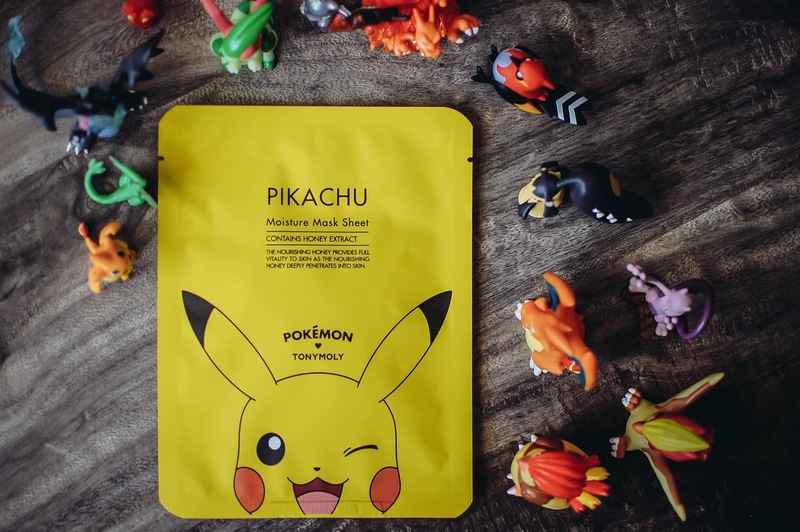 I did see some Pikachu lip tints that almost had me pulling the trigger but the shipping was just too insane even for me. I have one more mask left and will use it around my birthday for an extra little happiness. Thank you Liz! Thank you Ashley! You are both very appreciated. Love this Pokémon themed post! I collected the cards as a kid and only just got back into it as an adult when the game came out. It's a fun activity for hubby and I to do together. I love how your mom nurtured certain things in you and now your doing the same for your kids. My mom also did that for me and if I have children I hope I will be able to carry on that legacy. Mad props to all you awesome moms! Thanks!! I enjoyed rambling on about a little bit of what is going on at the moment in the Johnson household. Needless to say, it will be a Pokemon Christmas here, as I am sure it will be all over the world. Did you keep your cards as a kid?! We only had one family friend who kept a couple and he sweetly gave them to Savanna. She was thrilled. The older ones are pretty rare sometimes and valuable. Yes! Mad props to moms who nurture interests. What si the old saying? "An idle mind in the devil's workshop." Something like that.... keep the kids busy anyway. Focused on something positive. Have hobbies. I love that you are collecting cards too again! I admit, I get just as excited about watching them open them and play with them as they do about actually doing it I bet! LOL! Have a nice upcoming weekend. Any plans?